Get away from the city and spend a weekend closer to nature with this short camping trip at Bhatsa riverside. You'll check in at tea-time, and will have the whole evening to enjoy the chilly breeze off the river and watch the sun set over the trees. Your evening is a true camping experience: a bonfire, soft music, ghost stories, and a BBQ that you'll make yourself. You'll sleep in tents at night, listening to the sound of the river outside your tents. What a perfect way to spend the weekend! 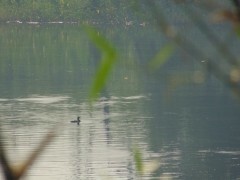 Bhatsa Lake is a freshwater lake located in Thane, Mumbai. It is formed by the dam on the Bhatsa river, close to where you'll be camping. The campsite offers parking spaces that are a short walk away from the campsite. You'll carry your belongings from the parking lot to the tent area. At camp, you'll be far away from civilization and can explore the wilderness all around. This spot is also a favorite among bird-watchers throughout the year, so do keep an eye out. • Camp under the stars in twin-sharing tents. • Watch the sun as it sinks into the horizon over Bhatsa Lake. • Try out a DIY barbeque. • Enjoy a bonfire night with soft music and a few spooky stories. 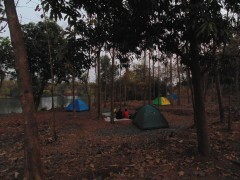 This camping trip in Maharashtra is an easy one and does not include any strenuous activities. However, if you have any cardiac or respiratory conditions, or any knee or spine problems, do consult your doctor before booking this camping trip near Mumbai. Footwear is not allowed inside the tent. Weapons, firecrackers or any such items are strictly prohibited during this camping trip near Mumbai. Damages done to the campsite, tents, bedding, or camp amenities by you will be compensated by participants immediately. Narcotics are strictly prohibited at the campsite. 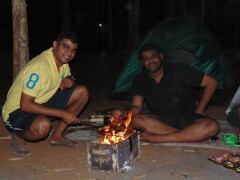 The decisions of the camp leader during the overnight camping trip near Mumbai are final and binding. If you cancel this camping trip near Mumbai 15 days before the start date: 75% of the trip cost will be refunded, minus any transaction fees. If you cancel this camping trip near Mumbai 14-10 days before the start date: 50% of the trip cost will be refunded, minus any transaction fees. If you cancel this camping trip near Mumbai less than 10 days before the start date: No refund. The operator reserves the right to cancel the overnight camping trip near Mumbai in case of bad weather conditions, political unrest, strikes, etc. The operator will not be held responsible for any injury, accident or loss of life during the overnight camping trip near Mumbai. The cost for damage or loss of any equipment provided by the operator has to be borne by the participant responsible. There is no pick-up for this camping trip near Mumbai. There is no drop-off point for this camping trip. 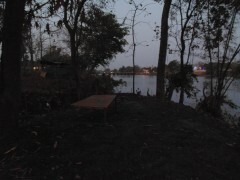 Arrive at the Bhatsa Lake campsite by 17:30 hrs, in time for hot tea and snacks. You can head to your tents to leave your bags inside and then set about exploring your surroundings. Grab a spot by the lake and watch the sunset, appreciating the peaceful surroundings and the gentle breeze as the night sets in. After that, warm yourself by the bonfire and figure out how to do the BBQ yourself. You can sing songs around the fire, tell ghost stories, or enjoy the starry skies. After dinner, you'll head to your cozy twin-sharing tents for the night. Wake up early and head out for a hot cup of tea alongside the river. You'll eat breakfast and chat for a while, and then it's time to pack up. You'll check out of camp by 09:30 hrs. Your camping trip near Mumbai ends here. • Please carry any specific personal or prescribed medication and personal first-aid kit. You can check in at the campsite by 17:30 hrs, and will be welcomed with hot tea and snacks. After sunset, you start the barbeque, grilling up delicious snacks for yourself. You'll have a relaxed evening with a bonfire, soft music, followed by a buffet dinner. At night, you'll sleep in twin-sharing tents equipped with bedding, pillows and a blanket. Wake up in the morning and enjoy a cup of tea in the fresh air. After a hearty breakfast, it's time to pack up. You'll have to check out by 09:30 hrs. Your camping trip near Mumbai ends here. You have to get to the campsite in your own transport, by 17:30 hrs. 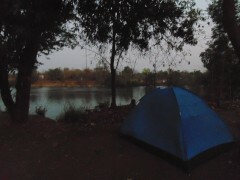 The campsite is near Thane, on the outskirts of Mumbai.